Samsonite Spinner Underseater (CT39-334846) is an eBags exclusive, durable polyester bag with a USB Port and is offered in black and majolica blue colors. It is easy to move around with the 4 spinner wheels underneath that rotate 360 degrees in multiple directions. If you will be carrying it through the parking lot or airport terminals, it glides very smoothly even on carpets or old pavements. If you will be carrying it through the parking lot or airport terminals, it glides very smoothly even on carpets or old pavements. It is designed to fit under most of the airline seats with the measurements of 16.5 x 14 x 8.75 inches including the wheels and the weight of 7 pounds as unpacked. The interior measurements are 13.35 x 9.2 x 1 inches, so is quite spacious inside but the laptop pocket is not large enough to fit in a 15.6-inch laptop, it is more for travel type smaller 14 inches and smaller and slimmer ultrabooks. The multi-zippered exterior pockets are nice to have so you can put your smaller items. And the interior pockets will help you arrange your clothes and other stuff. And there is the organizational panel inside the front pocket. 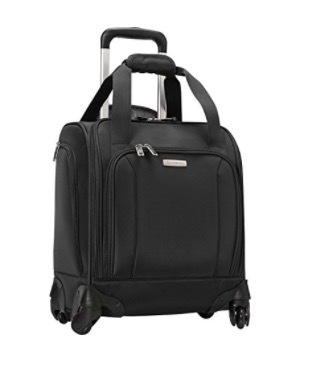 The carry-on Underseater luggage sits at a nice level on its spinner wheels for when you’re sitting, so you can reach out and grab things from it in the office. You can also hook up your personal portable charge to the built-in USB charging port. This is a solid and durable bag made from the 1680D polyester material that is thick enough and looks like it would hold up for a long time and through several travels. It is great for those looking for a lightweight bag that fits under the airline seats. The finishing looks slightly different to the other Samsonite bags, perhaps a little less refined. Although you have the plug and cord provided on this model, you need have your external battery to be able to use it. You can keep your external battery inside the bag, attached to the cable that comes with it and hooks up your tablet, laptop or smartphone directly without having to open the bag. If you like sitting on the window seat or if you are not tall and find it hard to get to the overhead bin, then this solid and good looking under seater type bag may be a great option for you. And this way you have a safer and more convenient and easy access to your belongings. This is a very good quality and durable Underseater travel bag with a fair price tag. It is offered with an impressive warranty of 10 years by the manufacturer- Samsonite.